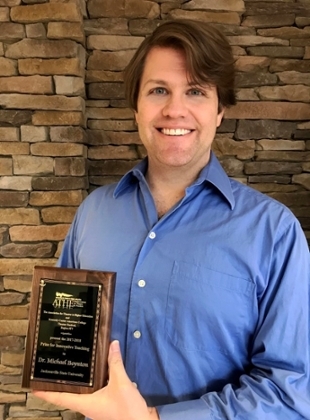 Dr. Michael Boynton, assistant drama professor, has been awarded the 2017-2018 Prize for Innovative Teaching from the Association for Theatre in Higher Education and The Kennedy Center American College Theatre Festival, Region IV. A rare and prestigious honor, this award celebrates the best, most innovative professors of theatre across the country. Boynton, who is an assistant professor of acting and movement, holds an MFA in acting from Wayne State University, an MFA in musical theatre writing from New York University's Tisch School of the Arts, and a PhD in theatre and performance studies from the University of Maryland, College Park. Boynton was also the 2017-2018 recipient of the ATHE/Kennedy Center Prize for Innovative Teaching.